A bit of Stencil Monoprinting done for this card and for the Retro Cool Release by Frantic Stamper. Normally this technique is done using watercolour paper and a fair amount of water, but I changed that a bit and used 110lb. cardstock, therefore not as much water or it becomes a hot mess. 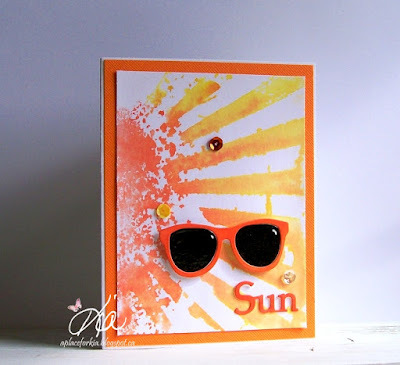 I used Tim Holtz Distress Inks Mustard Seed and Spiced Marmalade, and coloured my sunglasses using doCraft Markers in Black and Bright Orange. For the glass parts, I coloured then pressed them into embossing ink and used clear embossing powder to get the shine. I added the white marker once the embossing was complete. My sentiment is from a sentiment die "sunshine" where I cut the "shine" off. Some orange matting and scattered sequins finished my card. Products: Frantic Stamper Retro Sunglasses, Frantic Stamper Sunshine, Tim Holtz Stencil Rays, Tim Holtz Inks. The challenge at Splitcoaststampers today is to make a shaker that is unusual. 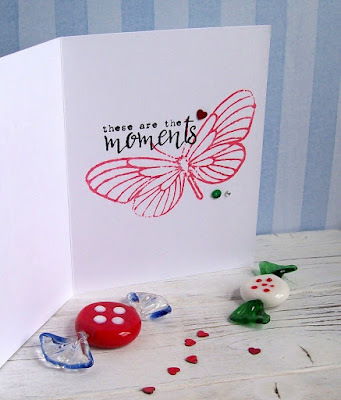 I love this die from Frantic Stamper and I thought it would make an unusual shaker card. To accomplish this I die cut my piece of cardstock for my top panel using the die. I was careful to keep all the pieces as they make the shaker. I then attached my acetate to the back of my card panel, then placed the completed die back in the cut out and applied glue in the bare spots. I glued in all the pieces, including my bright pink heart, then removed the word die. Bonus, another card! I then turned the panel over and applied my foam strips around my sentiment where necessary, as well as around the edges of the card panel. For the foam going around my word I powdered the inside edges so the sequins would not stick to it. I also added glue along the foam strips for added stick. 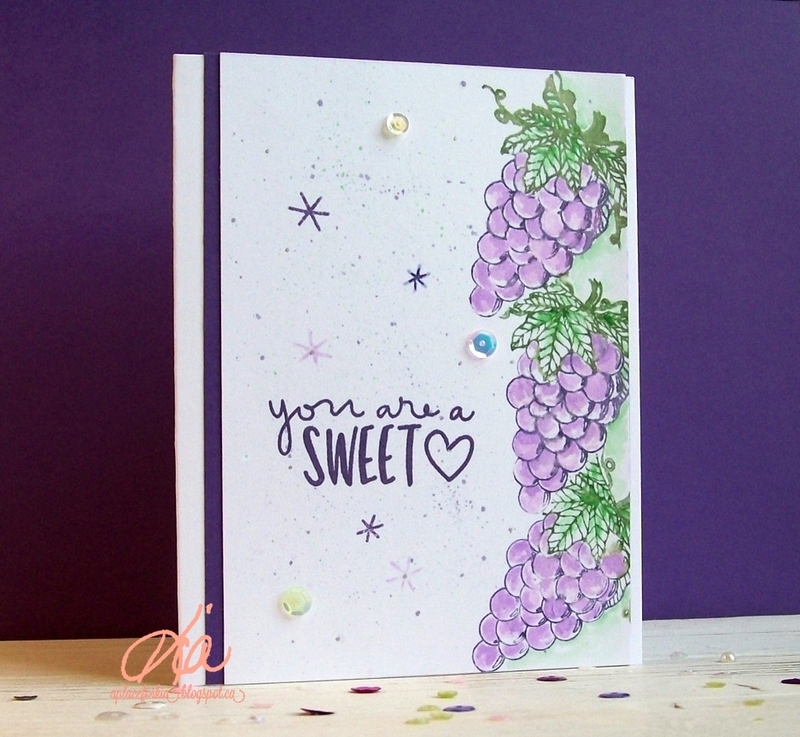 I then applied my shimmer background paper, then applied it all to my card base. A few butterflies and floral sequins, along with some crystals completed my card. Thanks for visiting today. 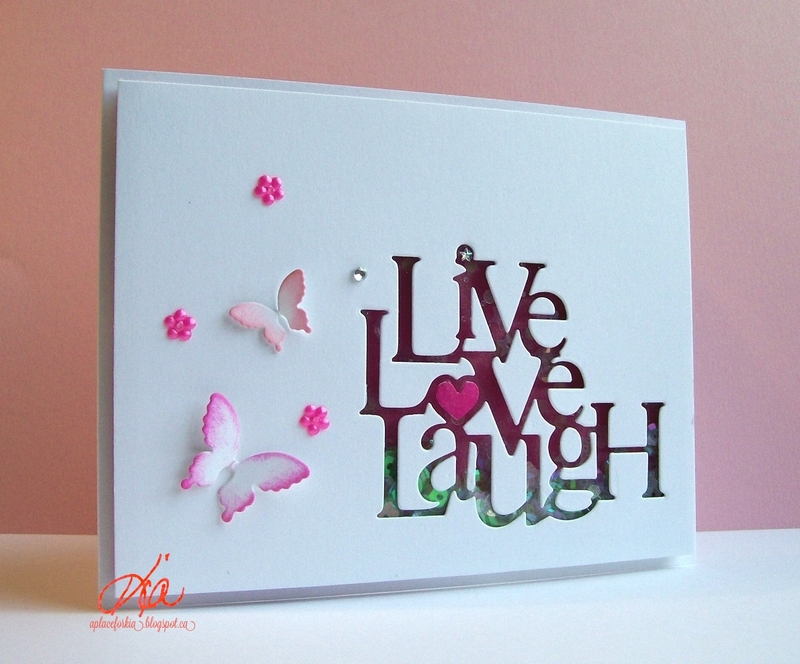 Products: Frantic Stamper Live Love Laugh, Frantic Stamper Petite Butterflies, Sequins, Crystals. 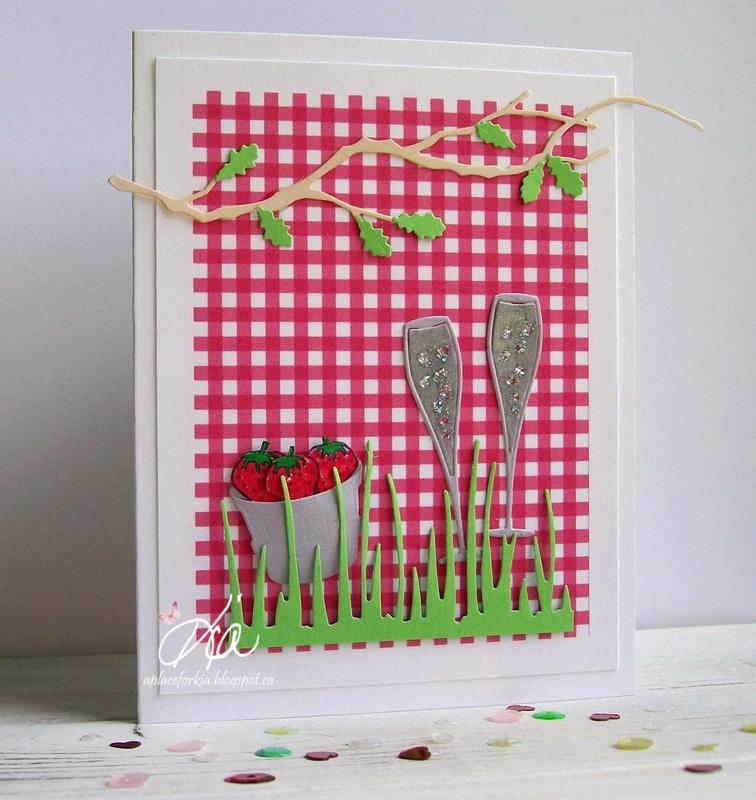 Yesterday I uploaded another version of this card, done in more subtle colours with gentle flowers to match. Today is my Big and Bold version, and I readily admit, I love this card. I stamped my sentiment with black ink this time, being sure to get good coverage on my stamp as I would only get one shot at this, MISTI does not help here. 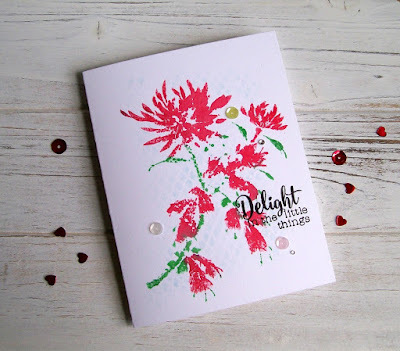 I then cut the newly released and fabulous Retro Daisies from Frantic Stamper. I then coloured each of the daisies with Chameleon Markers, opting for several layers of colour on the flowers to get that vibrant colour. I styled and attached on foam dots. And a card is not complete for me unless it has accessories, so sequins were added. I hope you enjoy this card as much as I enjoyed making it. Products: Frantic Stamper Celebration Stamp Set, Frantic Stamper Retro Cool Release Retro Daisies. A birthday card with a lot of Wishes. 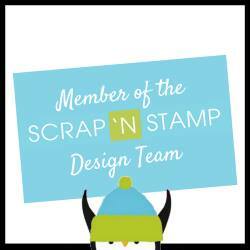 The stamp I used for my background is by Frantic Stamper and is perfect for this kind of repeat. I wanted a background for my flowers that was soft like the flowers so I used Memento's London Fog Ink to stamp the background. I first stamped the sentiment in another pattern, but that went in the garbage. I kept trying the stamp in different ways on scrap paper until I came up with this pattern. I inked my stamp several times before stamping, as I only had one shot at good coverage. I stamped my flowers using the same ink and watercoloured, before cutting. 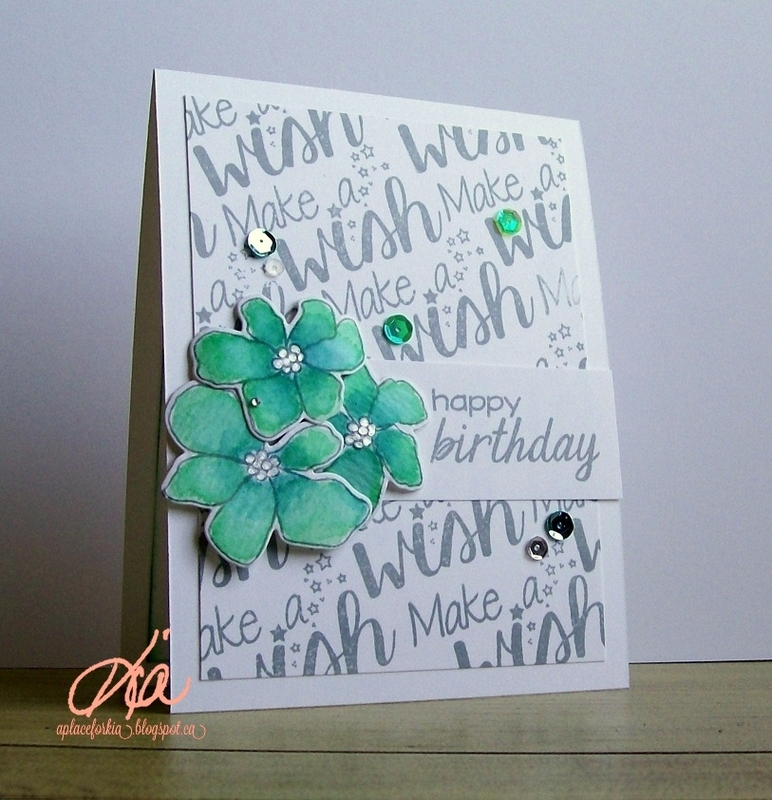 I added some silver micro ink to the flower centres. I stamped the banner again with the London Fog and attached, then styled my flowers and attached on foam dots. And of course, sequins and crystals to finish. 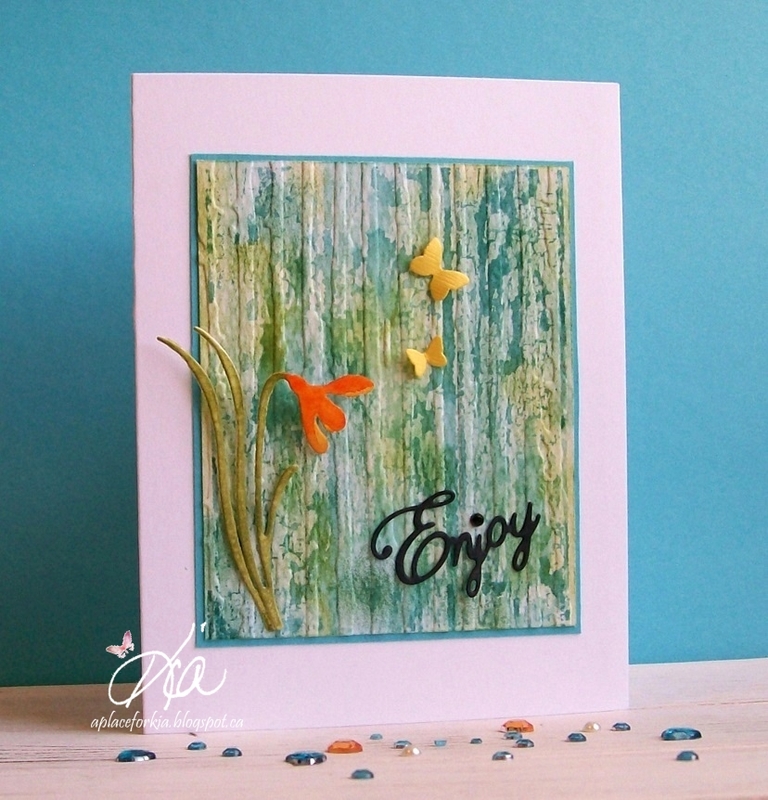 Tomorrow I will show you a bolder card using the same method for my background, but a different colour and bold dynamic flowers. See you then. 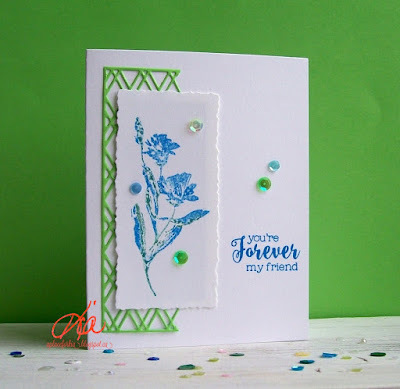 Products: Frantic Stamper Celebration Stamp Set, Simon Says Stamp Artful Flowers, Simon Says Stamp Designer Flowers, Tim Holtz Distress Inks. 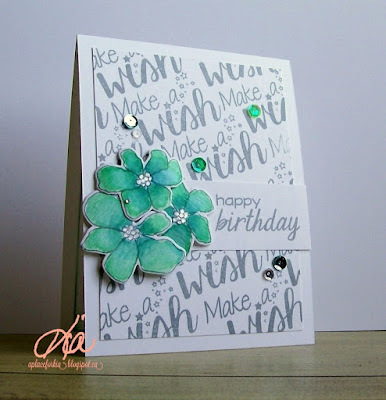 This card is for today's Colour Challenge at Splitcoaststampers. The colours this week are Crushed Curry Pumpkin Pie and Watermelon Wonder. Such wonderful colours. I don't have Stampin Up products, so I used what I had on hand. 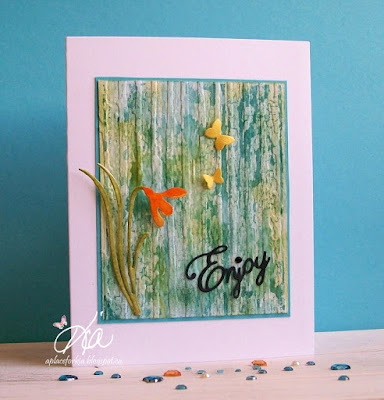 I embossed my background using the Crushed Curry and clear embossing paste. It is very soft from the emboss resist method I used. I made the Watermelon colour by sponging with a bright pink and sponging over with cream ink. I embossed my sentiment with the pumpkin ink and clear embossed. Behind the sentiment on the back of the vellum I swiped the crushed curry. For my rose I used my aqua brush to pick up my colours, drying and adding colour again. I mounted the rose on foam strips. To finish I added a few sequins and a lone crystal. Thanks for having a look today. 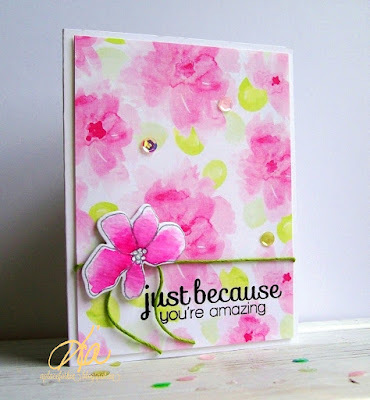 Products: Penny Black Circles and Lines, Frantic Stamper Scribble Roses, Stamplorations Fond Expressions 2, Sequins, Crystal Gem, Tim Holtz Distress Inks, Stampendous Inks. which I added with foam dots, along with some twine and my signature sequins. Thank you for having a look today. 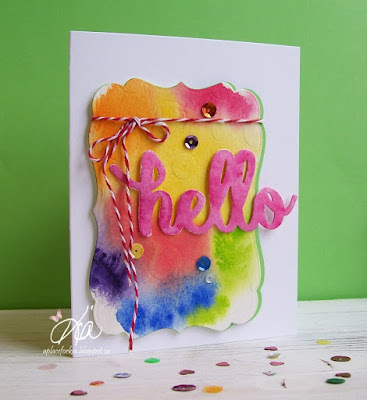 Products: Pink Petticoat Designer Paper, Ranger Watercolour Paper, Winsor Newton Watercolours, Simon Says Stamp Artful Flowers, Simon Says Stamp Designers Flower Die, Simon Says Stamp Flower Friend, Twine, Sequins. I am guest designing for the month of May with the Colour Challenge at Splitcoaststampers. The colour picks are So Saffron, Tempting Turquoise, and Melon Mambo. For my card I inked my stamps and spritzed lightly with water before stamping. The turquoise flower is an outline flower, so I used my aqua brush to lightly add colour to the flowers, then stamped my sentiment in the black. I added the turquoise border to my panel, and on the card base I added glitter ribbon. A few sequins and crystals completed my card. 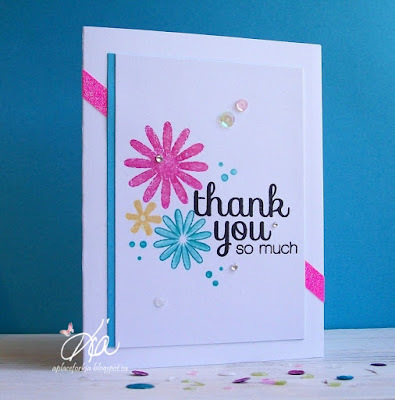 Thanks so much for having a look today. 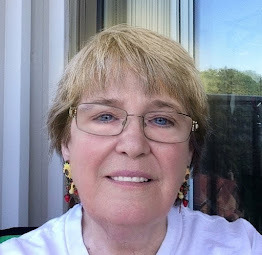 I hope you enjoy my card and my new Blog look. 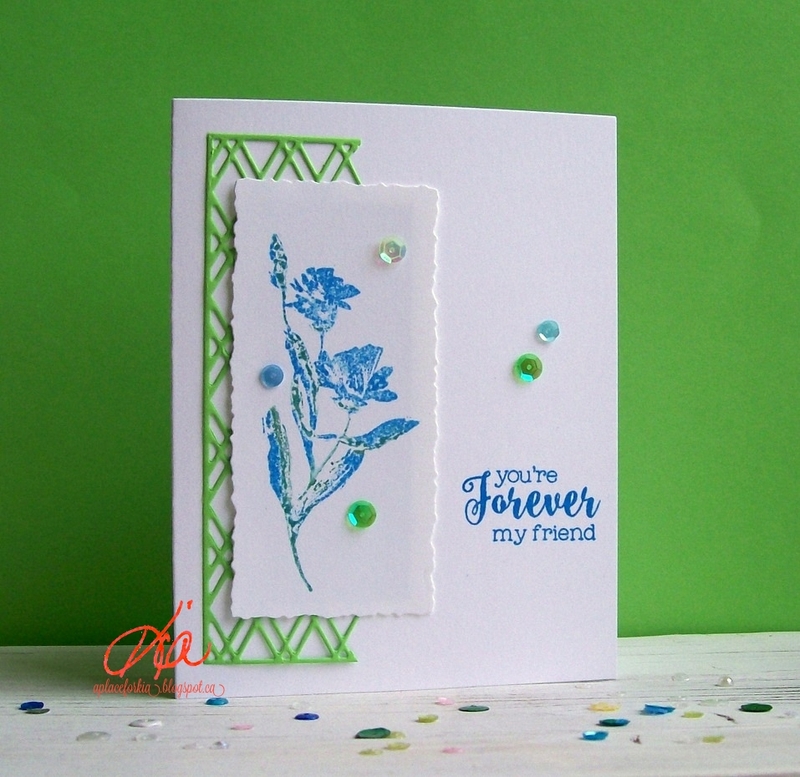 Products: Simon Says Stamp Flower Friend, Glitter Ribbon, Sequins. I am excited to share my new system for organizing my dies and stamps. I, like most of you, have tried several different systems, all of which have not worked out for me. I was getting frustrated until I chatted with Lydia from Understandblue who I credit for the original idea. I have made a few changes, fine tuning the system to become my system. 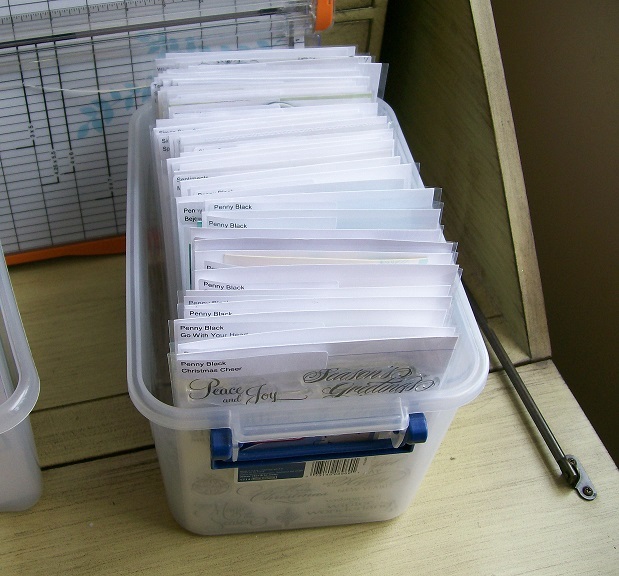 Previous to this system, I used the ArtBin storage bins for storing my dies, and my stamps were in a large container and out of control. The ArtBin didn't work for me for several reasons, mostly I did not like the layers of dies. It just made looking for a die miserable. I have the sleeve, the cardstock, and the magnetic sheet. I reused my magnetic sheets from my Artbin case, cutting them in half and cutting off the labels. The cardstock is cut to 5" x 8.5" and scored at 7", with the 1.5" folded up to catch anything if it falls of the sheet and to protect the sleeve from the edges of the magnetic sheet. These are the sleeves I have used, as recommended by Lydia. 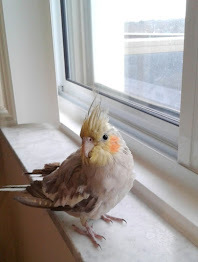 I purchased them through Amazon.ca. They are 5" x 7". So when I say I cut the cardstock at 5", it acutally is 1/16th less in order to allow the stock to slide into the sheet. In the back of each sleeve I have these mini sleeves for extra die cuts that didn't make it on my card. For my stamps, I did the same system, but the cardstock is cut to 5" x 7" as I did not need support in the bottom of the sleeve. Filed along with my stamps are the coordinating dies to the stamps, if there are any. In this way, I am not taking out 2 containers, just the 1 needed to complete my project. I also have the mini sleeves in the back of these dies to store left-overs. This is one of my die containers, I have 2 filled. I did not use the same containers as Lydia as they are extremely pricey here in Canada. Instead I used containers I already had and they work perfectly for me. This is one of my completed stamp containers. I also have 2 of these so far. And, for my Spellbinder dies and the like, I have them stored in a separate place as I felt there was a lot of dead space if I used this system. 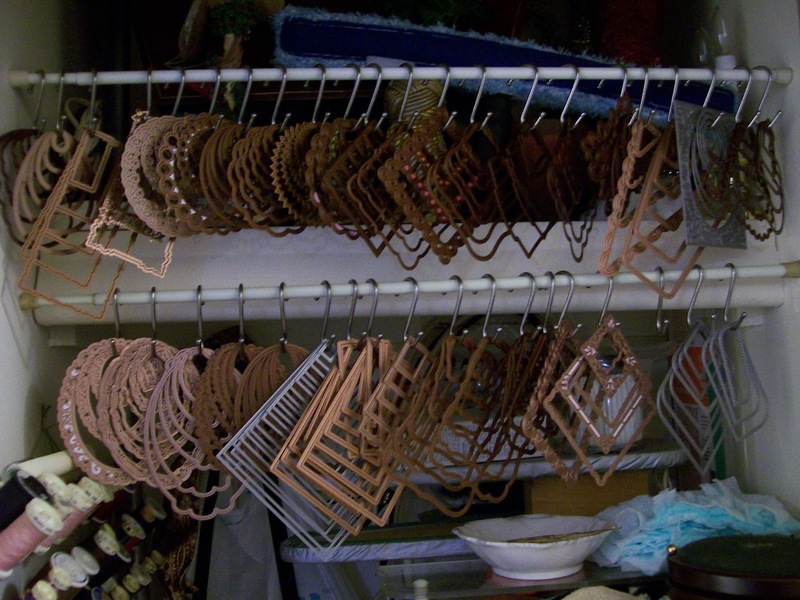 They hang on S hooks on a tension rod in a closet along with other craft things. If I need to move them to get the things on the top shelf, they just slide up and down easily. I take the hook when I need to use them, so everything remains together. I hope you enjoyed my little show and tell. Thanks for joining me today. Our Clean and Simple Challenge this week was to make "groovy elements". I initially misread this and headed in a different direction, and thankfully had another look at the Design Team post. But, I don't really have anything that could be considered "groovy", so I went for the "groovy" era, that being the 60's and 70's and did a wild background and large hello die using Winsor Newton paints. This is one case where I wanted my paints to run together, just a bit ~ so I blew on the paint as I was tilting it. Once the background was dry I die cut the paper with the labels die and embossed with the big circle embossing folder, as I think things were going round and round back in those days! I shadowed using bright green cardstock and added some red bakers twine just because I think it needed more colour! I then attached on foam strips and attached my big hello which I styled just to give it the round feeling and added it on small foam dots ~ then my signature sequins. Clearly, I had a lot of fun making this card. Thanks for looking. Products: Frantic Stamper Large Hello, Spellbinders Labels 17, QuicKutz Polka Dots Embossing Folder, Bakers Twine. Products: Deep Red Weathered Wall, Joy Crafts Spring Flower Die, Cheery Lynn Designs Enjoy, Memory Box Butterfly Delights. 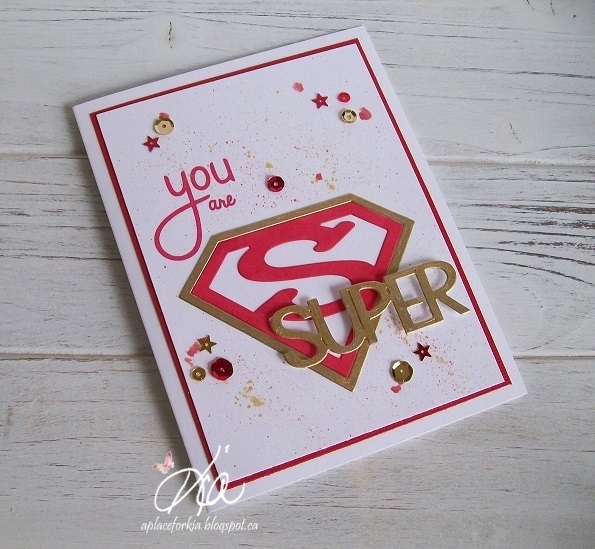 The following cards I did for the Frantic Stamper You are my Super Hero release. 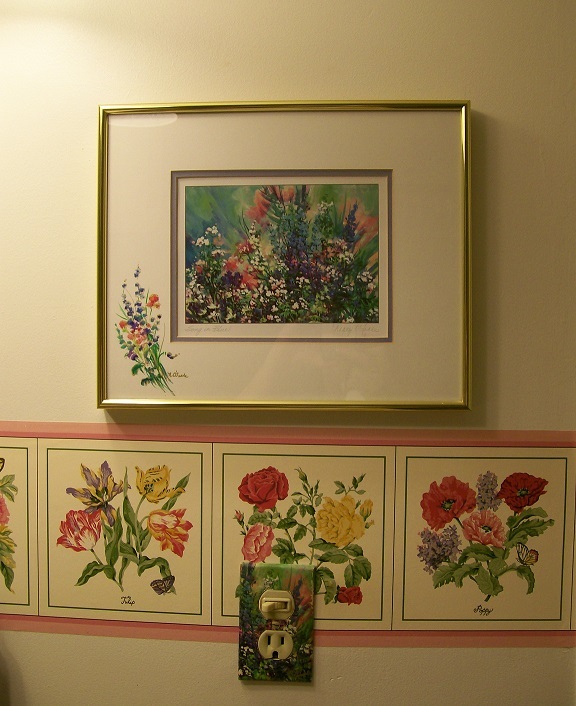 I have linked all of the products I used on these cards for ease of access at Frantic Stamper. I hope you enjoy these cards. I really love this card. I was not sure where I was going when I started it, but I am happy with how I ended it. I stamped using the "you are" from the Puzzle Me stamp set and the Shield along with Super from the Super Hero words set, which I coloured using my gold leafing pen. For my card background I did some splatting with red watercolour ink and gold ink. I love star dies and I think one can never have too many of these dies. This set is Nested Stitched Stars along with the negatives and also a star from the Independence Day release, which is also a stitched set. I used my silver leafing pen and some Viva Decor Inks on the stars. I also used the Trophy which I die cut from gold metallic paper. 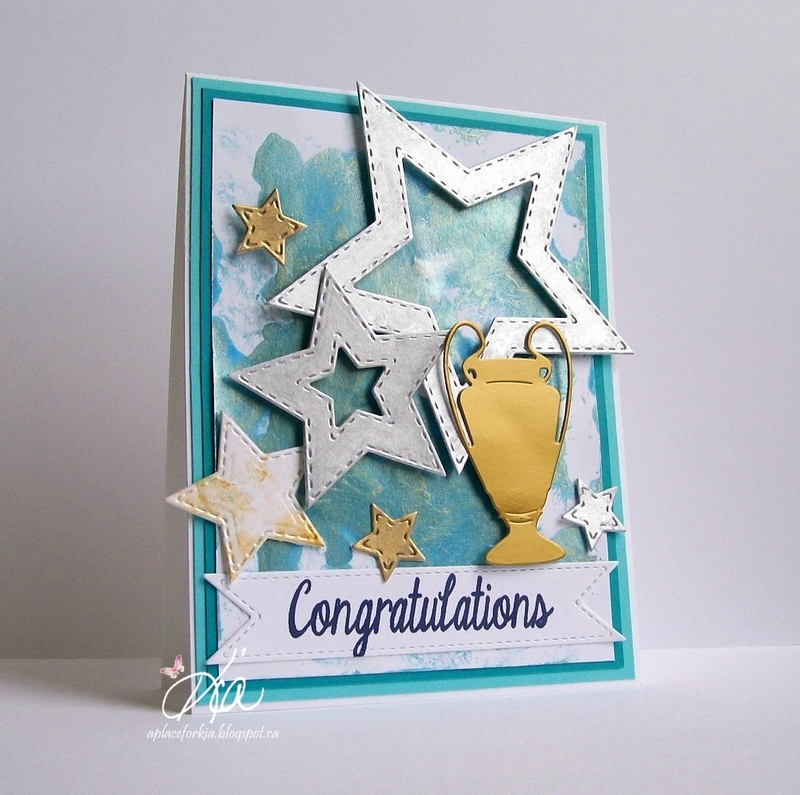 The Congratulations sentiment is stamped using the Stitched Double Fishtail Labels. For my card background I mixed up some Viva Decor Inks in Blue, Platinum and Gold along with water and rubbed my cardstock into the mixture. Superman is on the job in this card. I think we all remember watching these cartoons when we were younger. 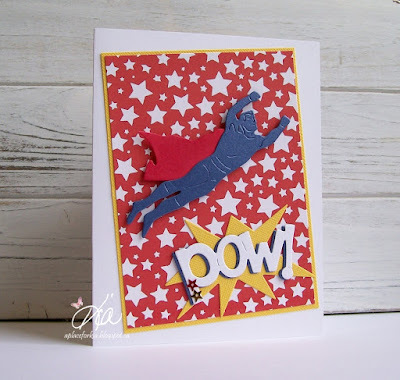 I used designer paper for my background and added Flying Hero done in a blue metallic paper with a red metallic Cape and the pow zap bam! on the yellow bubble with the pow in white and shadowed in blue. For this card, I die cut the Star Line die a few times and coloured using Spectrum Noir Markers. I topped the Star Line with the Pow Bam Zap set, which includes the background cartoon bubbles. I dragged my bubble through a mixture of Viva Decor and water and topped with BAM! done using my Gold Leafing Pen. A few sequins finished my CAS card. 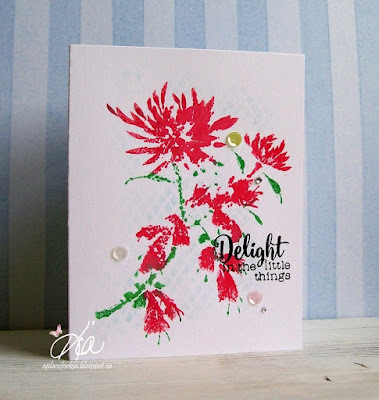 I am guest designing for the Colour Challenge Team at Splitcoaststampers this month. The colours for today's challenge are Real Red, Sahara Sand and Cucumber Crush, using Stampin' Up colours, and dessert is "having a picnic." I don't use SU, but I used colours very close. This is my idea of the perfect picnic, champagne and strawberries, lots of strawberries. I did not have tiny strawberries, so I drew mine while looking at some on my computer screen and coloured with Docraft Markers. For the champagne I coloured using Martha Stewart Glitter Markers and added some stickles for bubbles. My red gingham dp represents the picnic throw. Thanks for having a look today. Products: Frantic Stamper Champagne Glasses, Memory Box Branch, Impression Obsession Oak Leaves, Impression Obsession Basket, Poppy Stamps Grassland Border. 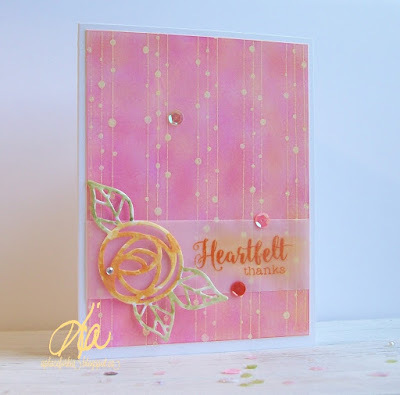 Products: Cuttlebug Script Embossing Folder, Frantic Stamper Wedding Wishes Stamp Set, Frantic Stamper Champagne Glass, Joy Crafts Circles Squares & Hearts (for the Hearts), Gold Embossing Powder. For these 2 final cards, I finally used the dies to celebrate Canada Day. 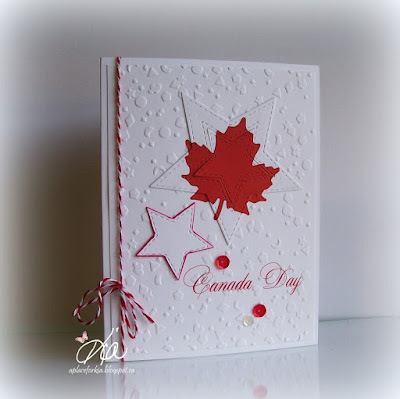 This card I again used the Small Stitched Stars and a maple leaf digital stamp inlaid in the larger star. 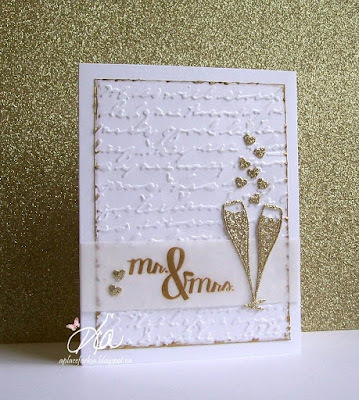 I used a celebration embossing folder for my background, added sequins and bakers twine to finish. 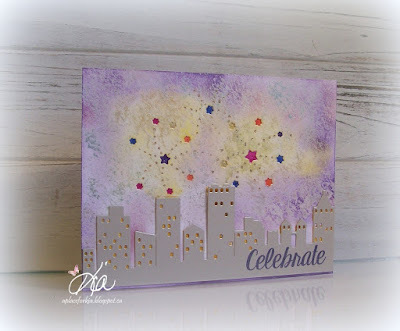 I used the fabulous Cityscape and Reverse Cut Fireworks for this Celebration card. I opted for a purple night sky for my card so I did a Faux Mother of Pearl Technique which I think shows off the fireworks wonderfully. I coloured the background for the buildings with my glitter markers to appear through the windows. The Cityscape I cut from silver metallic paper - when I watch the fireworks from my building the buildings all appear a lighter colour from the fireworks in the air - fabulous! I finished by stamping my sentiment in a dark purple. Products: Frantic Stamper Cityscape, Frantic Stamper Reverse Cut Fireworks, Frantic Stamper Celebrate Stamp Set, Frantic Stamper Small Stitched Stars, Frantic Stamper Celebrate, Do-Crafts Mixed Confetti Embossing Folder, Tim Holtz Distress Inks, Sequins, Bakers Twine, Martha Stewart Glitter Markers. Another card celebrating the Independence Day release at Frantic Stamper. 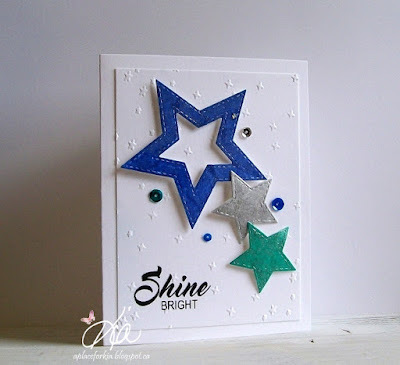 For this card I used the Small Stitched Stars Die Set. I love these stars, and to show them off I coloured them using my glitter markers. I love the shine from the markers and how it shows the stars off, hence my computer generated sentiment. 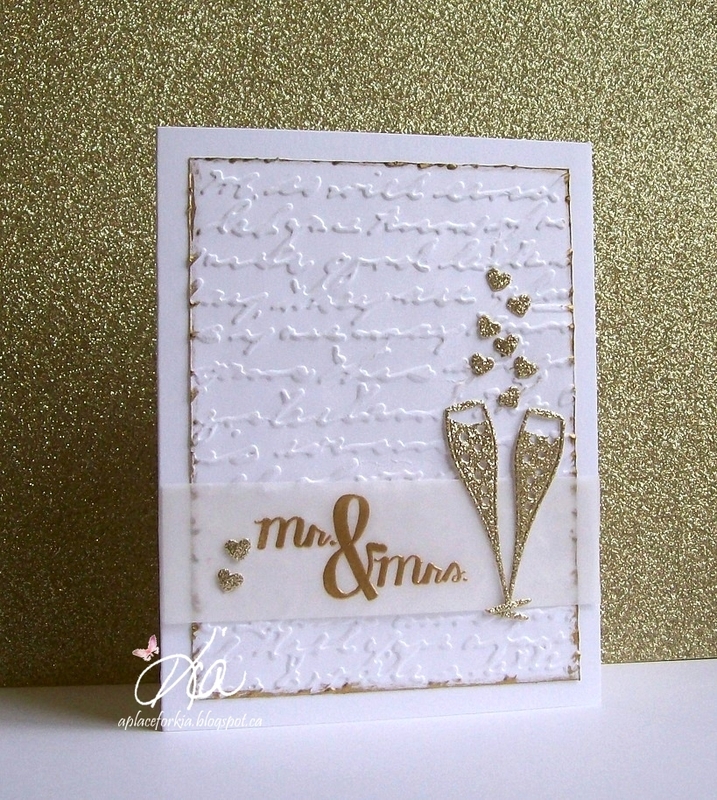 For the embossed background I used an embossing folder from my christmas folders that worked perfectly for my card. 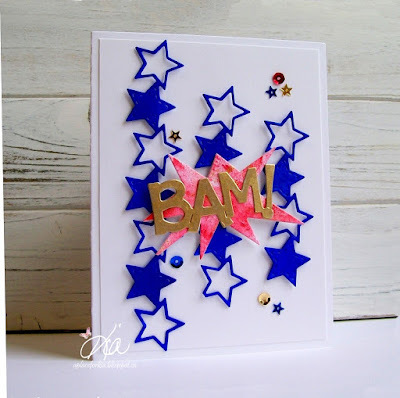 Products: Frantic Stamper Small Stitched Stars, Crafters Companion Embossalicious I Believe Embossing Folder.